Imported wire control calls are exceptionally clear and smooth, the noise-canceling microphone ensures crystal clear conversations. 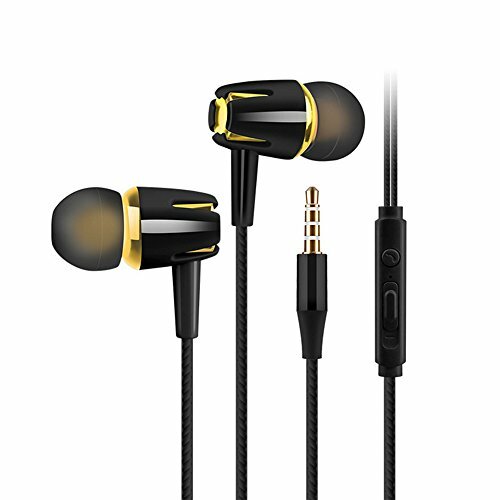 Enjoy high quality music:in-ear design effectively reduces noise and ensures low song leakage. Using high-quality metal plugs,more durable,does not affect the sound quality,can be used in a variety of digital devices. Ear Earphones Compatible: iPhone, iPod, iPad, Android Smartphone and Tablet, Windows Smartphone and Tablet, MP3/MP4 Player. Built-in High-definition Microphone: Using a hidden microphone,sensitivity up to 95±3,make voice calls more smoothly,sound quality of the music is clearer. Good Sound Quality From Good Quality: Using 13.5mm high-performance moving coil unit,and using ultrasonic techenology,the bio-fiber composite diaphragm has a wide output sound field,enough to conquer your music. Ultra-lightweight headphones are easy to store and carry, so you can wear it anywhere and anytime without any inconvenience. Compatible with all 3.5mm audio cable jack smartphones and devices, including the full range of Apple iPhones, Samsung Galaxy and Note Series, HTC, laptops, tablets, PC and more. If you have any questions about this product by JCBABA, contact us by completing and submitting the form below. If you are looking for a specif part number, please include it with your message.